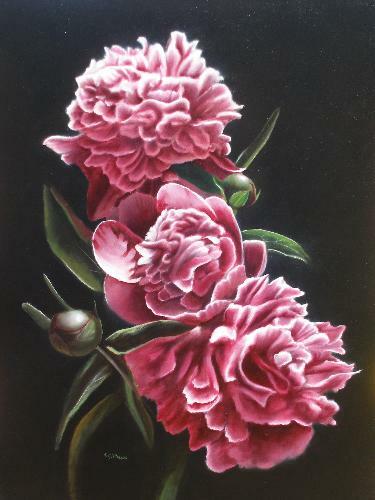 The Peony flower, an intricate and difficult flower to paint. 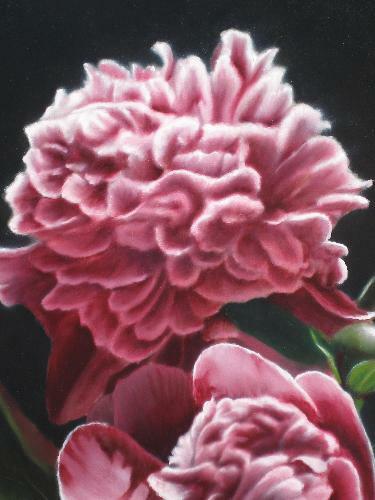 Peony flower, pretty pink and perfect for painting! 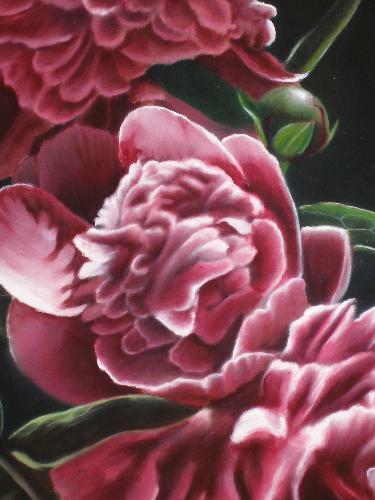 How to paint the Peony Flower and learn a couple of great secrets that will speed your process of painting up, so you can finish sooner than you think. 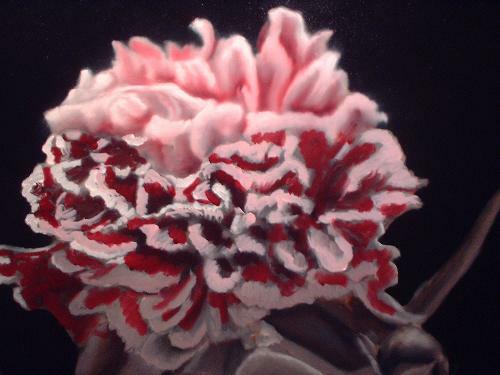 This is a very complex flower head to paint, so bear with me as I show you how to proceed. Lets start with our reference photo, taken at an extreme angle in order to capture the sharp contrasting sunlight from the top. 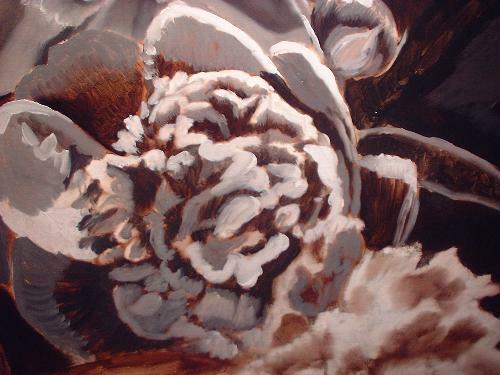 Most folks when they view the finished work assume the blossoms are in a vase, but they don't know the view was from the very tip top looking down on the vase. Blossom placement helped with the illusion. 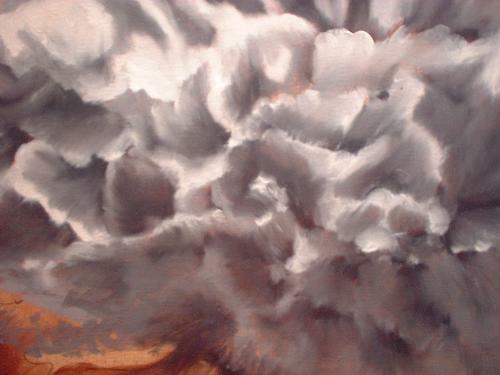 We start with our normal umber underlayer and the beginning stages of our gray layer are shown. But wait a minute! 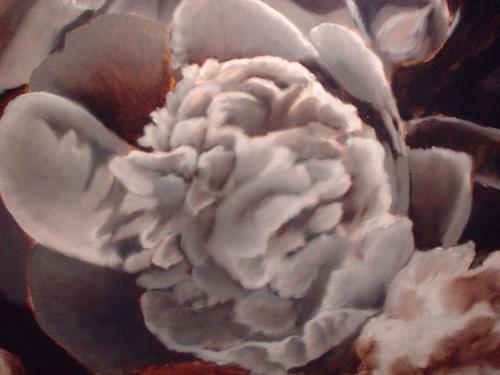 Take a closer look at this umber underlayer. See anything different than earlier demonstrations? Did you notice all the white? That's right! I've taken what normally is a light area in the umber stage and added some white to the layer to help speed up and bump up these areas. 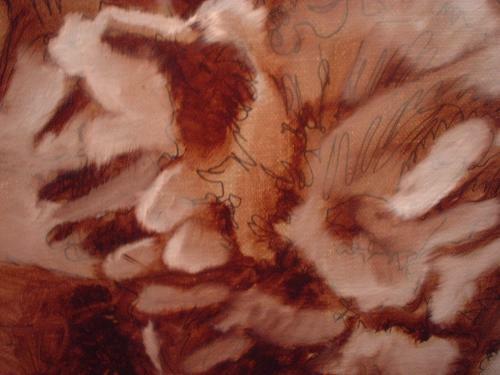 I've added both alittle umber and liquin to the whites to speed up their drying time. This means less work in the dead layer! Ready for a 2nd powerful secret! 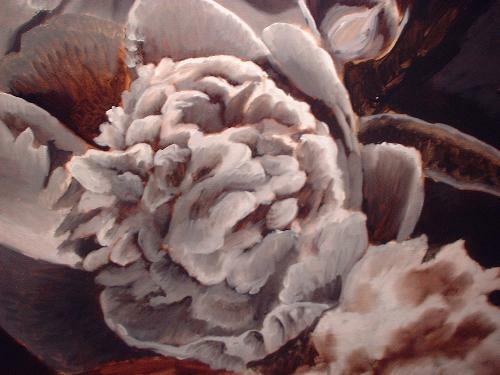 Check out the laying in of the grey layer paint for this blossom. 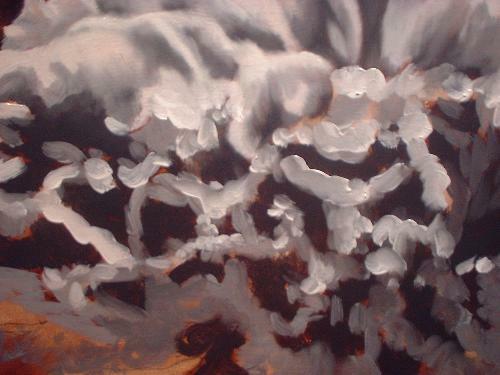 Notice there are large variations in tone between one gray mass of paint and the next. Because these blossoms are so intricate, with soooo maaaaany pedals, I've decided to incorporate another technique to speed things up! Can you see what I've done? If you said blending, you're correct. 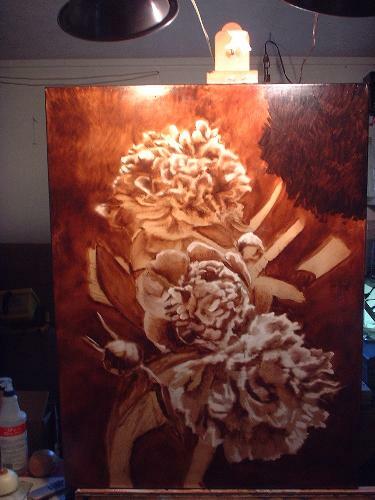 I've begun to blend the paint right there on the canvas. 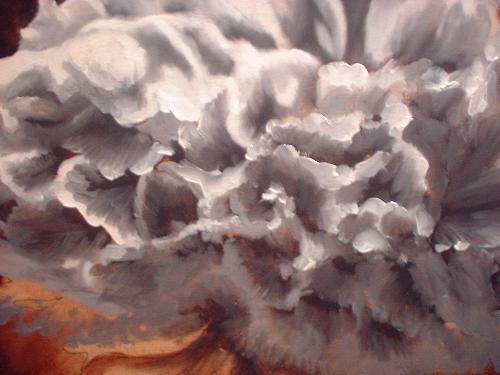 Instead of mixing 8 different shades of grey, I've used only about 4, and finished the other 4 shades by blending them right on the canvas! 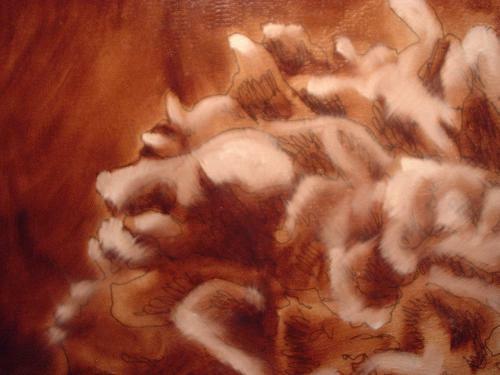 This cut my time in half, and when you add that to the additional whites from the umber layer, I'm smokin' fast with this painting! Here you see additional softening with the big mop brush of the blossom. Let's see it again on another blossom! Now do you get the picture? Let's watch as I do the very same thing in the color layers! Big blocks of color that are then blended on the canvas! What a great time saver! 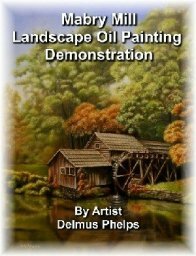 Now you just need a few blended colors on the palette, and your canvas can be your mixing pot for the rest. 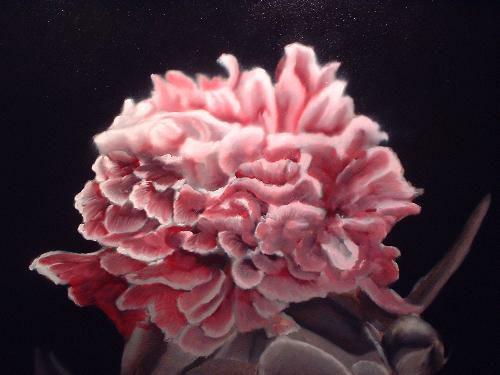 The finished peony flower piece and a few close ups of the blossoms. 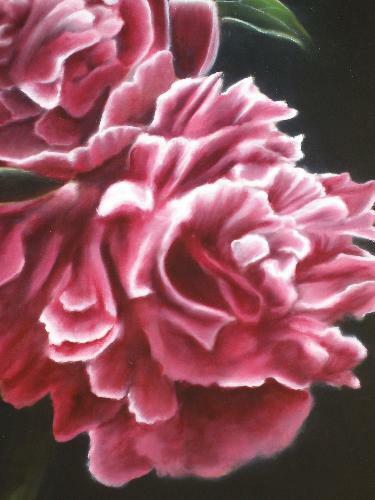 Stay tuned for another episode in easy oil painting! I've got white lily's on the brain, so if you love this flower, sign up for my ezine and get the update when I'm done with it! 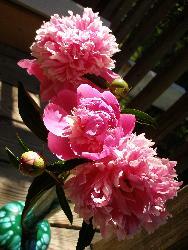 Back to top of peony flower demonstrations.